Today we tell about what to visit in this amazing country! Algeirs, La Blanche or El-Behdja – these are the names that the capital of this state is referred to in the world. They mean, respectively, ‘islands’, ‘white’ and ‘merry’ and correspond with reality fully. Light multi-million metropolis Mediterranean Sea. Also, city of Algeirs constitutes numerous staircases that connect plain modern part of the city with the ancient one, located on the top of the hill. Feel like getting lost in a maze of an ancient city? You should go to Kasbah. Width of narrow streets sometimes falls short of a meter and no one knows for sure how many native citizens are there. According to various estimates, there are 50 to 70 thousands but you can only meet them if you are lucky. Their whole life is over there, inside, behind thick walls of buildings. Main means of transport in the old town is donkeys; they carry both people and goods. “Donkey Cab” can take you for a snake-shaped tour along intertwined passages of the place to look at one-storey buildings and some sort of alternative vegetation – trees in pails and multicolored doors decorated with bright ceramics. To become better acquainted with the country after a walk around the capital one should take trips to other, equally interesting cities. Main means of transport for Algerians is buses: 1 dinar per 1 kilometer. It’s better to wait and board a new one, equipped with air conditioner. There is a bus station in nearly every large city. Trains are faster, more expensive and only operate in the north of the country but they run on schedule. Railway connects Annaba, Constantine, Algeirs, Oran and Tlemcen. Air service costs locals $20-$30 for a one-way ticket, at that same route will cost a foreigner $120-$150. 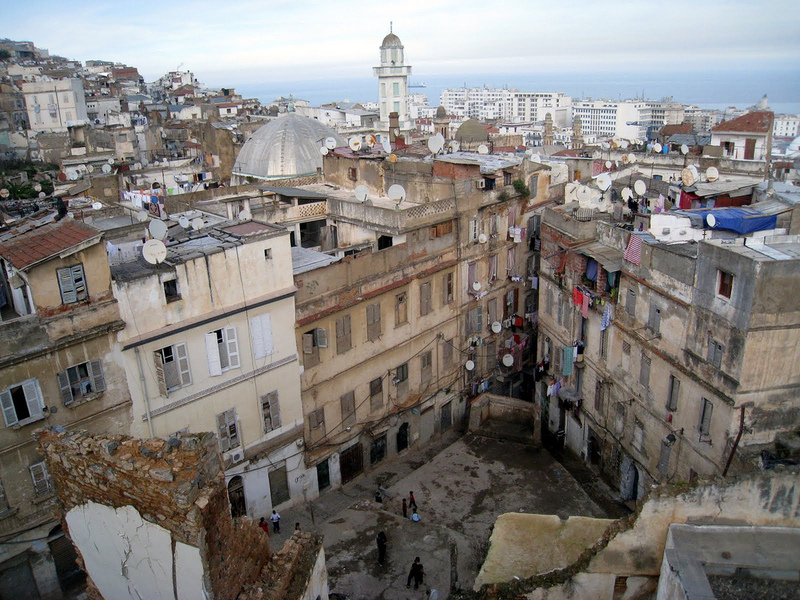 It will take eight hours of a bus ride to get to Annaba from the capital. Course de la Revolution, the central street, remembers French charm; and Mediterranean harbor has preserved the spirit of freedom. All made in European style, the city is attractive in May-to-September season day and night. A stay at a double room of a hotel is $65 to $250 – depending on desires and abilities. Golden sand beaches, l'Edough National Park with centuries-old trees, catholic basilica-temple of Saint Augustine – it only remains to choose where to go first. 66 km away from Annaba Hammam Meskhoutin thermal springs are situated. Water temperature in them constitutes about 97 degrees so one can boil an egg carefully. Even spatter of hot-boiling water can leave burns, not to mention attempts to “try water” with either hands or feet, therefore it is dangerous to approach boiling mineral springs. 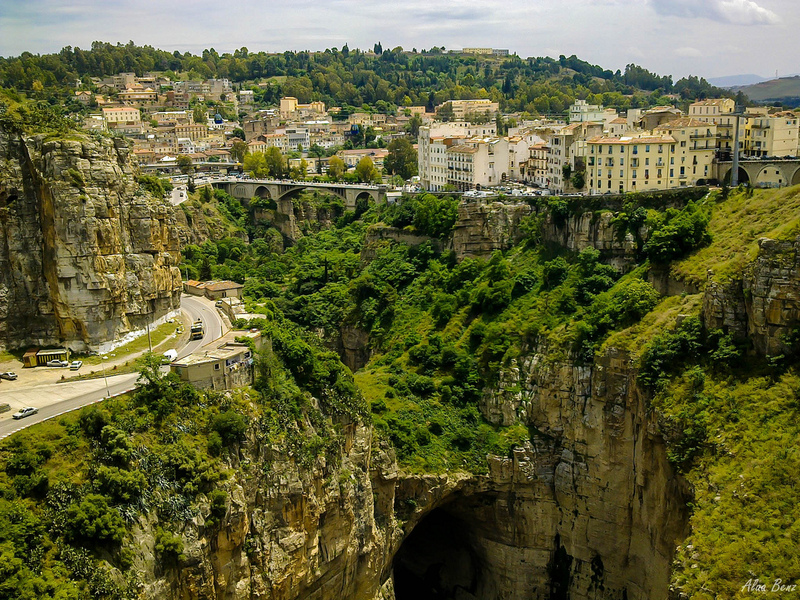 Hotels closest to Hammam Meskhoutin are located in Guelma where one has an opportunity to undergo procedures using mineral water at local day spas. Another must-see city is Constantine founded two thousand years ago at a height that exceeds 600 m. Mountainous plateau surrounded by inexpugnable rocks, hanging pedestrian bridges and century-old viaduct that supplies potable water to houses on the brink of an abyss – citation of these amazing facts itself takes your breath away. Depth of the ravine in certain places exceeds 300 m but it is no obstacle for the citizens who cross the abyss by narrow hanging bridges. 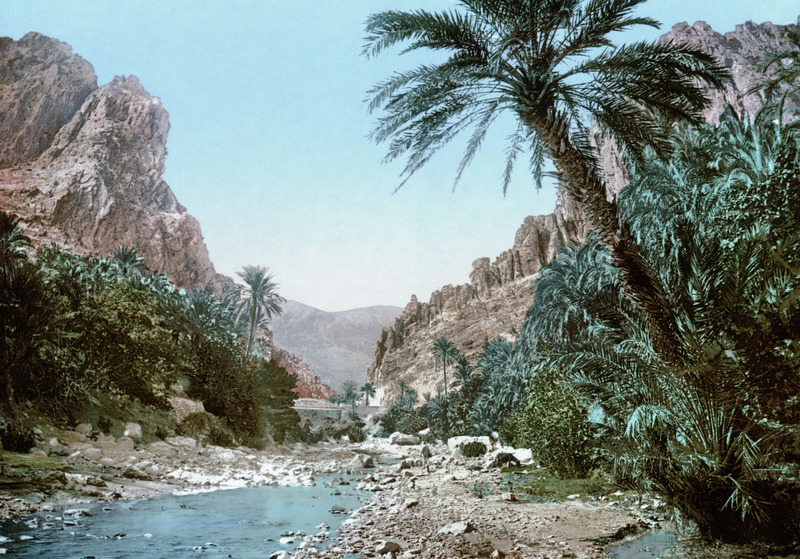 Get acquainted with the desert at Aïn Séfra. 691 km away from the capital the town is situated, it is called the Gate to Sahara. Actually, there are several of them but it is believed that the settlement is located in the very beginning of the sandy kingdom therefore the spot fits first meeting as a fiddle. FYI, drives deep into Sahara are allowed with state guides only. 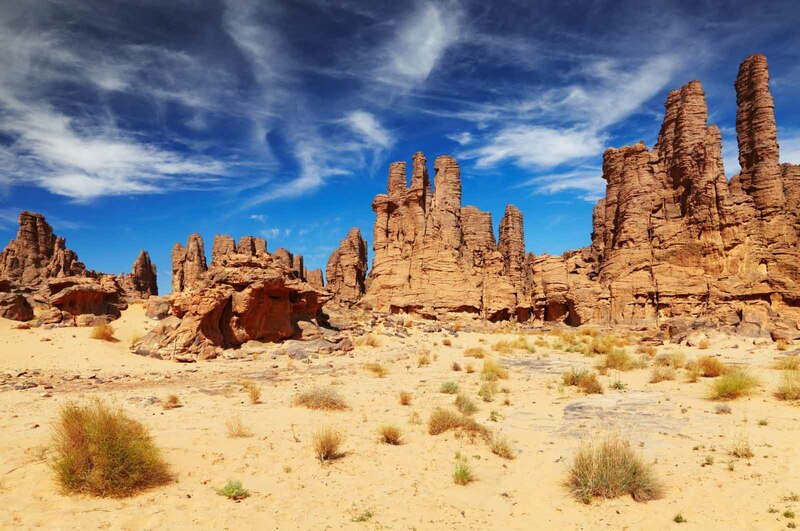 Visit Biskra – oasis city where one can see the oldest mosque of North Africa, Sidi Okba, erected in 686 and also Batna and Tipaza with mausoleums of Mauritanian kings and ruins from ancient times. Have a look at Blida with 50 000 orange trees planted around it to see Al-kawthar mosque build in 16th century by pirate Barbarossa. Drive by a capital of castle-state of Heptapolis in M’Zab Valley 500 km away from the capital to find out what ancient ksour-castle lives like. Community of settlements founded by the Ibadi attracts with general appearance of constructions that look like kids’ bricks the color of the sky and the color of the sun, with minarets – guarding towers. 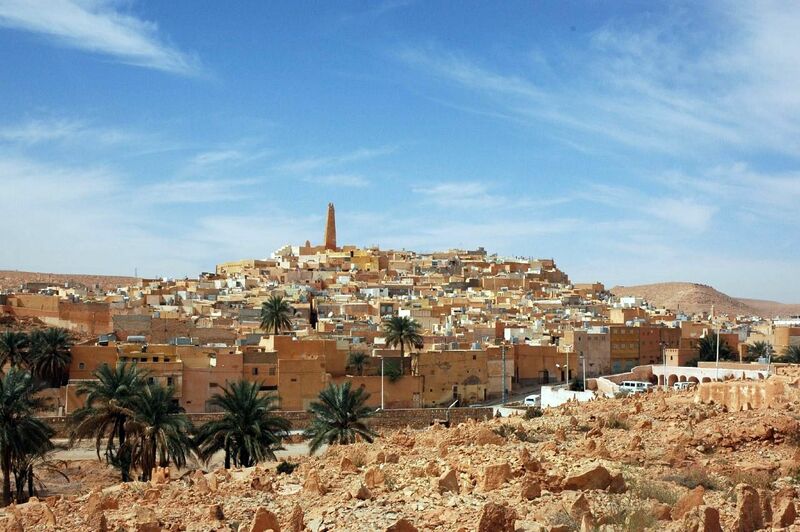 Only ksour Ghardaia and ksour Beni Isguen are open for tourists and at that the latter one only partly and before dusk. What’s better not to do? Try not to experiment with clothes decorated with coins. What is adornment for Europeans, for Algerians is blasphemy. You shouldn’t take pictures of local women, too. Berber carpets and mattings with ethnic patterns, embossed copper, silver, bronze, leather and wooden items as well as straw articles. Maghreb dishes spiced with traditions of Turkish cuisine – that’s how culinary portrait of Algeria looks. At that an obligatory and universally popular nuance is French bread. Before setting on a journey, it is worth learning the meaning of the following words: reshta – hand made noodles with chicken and beans, meshwi – grilled mutton or beef steaks, taguella – bread baked in sand, tajin – thick omelet stuffed with either potatoes or meat. *The hottest month of the year is August. *Bars with alcohol drinks aren’t easy to find in the capital, more often than not it is just a closed door with an ordinary signboard. Before entering a customer should knock. *When local citizens meet, they kiss each other either two or four times. *A bride can change up to 12 dresses during her wedding. *Algerians believe that long horns of a crescent on their flag bring the country happiness.